A festival celebrating the heritage of St Colmcille takes place this weekend in Glencolmcille. The festival Opening Address will be delivered at 8pm on Friday night by Dr Eithne Ni Ghallchobhair of Royal Irish Academy. This will be followed, at 8.30pm, by one of the highlights of the weekend, a bi-lingual lecture on the links between Donegal and the Hebrides by Aidan O’Hara. The Donegal broadcaster, who spent many years with both RTÉ and the CBC (Canadian Broadcasting Corporation) has just written a new book on this rich, fascinating topic. Dr Dr Seosamh Watson will officially launch the book ‘Altlantic Gaels – Donegal Links with the Hebrides’ on Saturday at 7.30pm. There are a host of other great events taking place over the weekend, including a beginner’s conversation class in Scots Gaelic taught by Andreas Wollf, a broadcaster with BBC Alba and an instructor in the Ulpan method of language teaching. There will also be a concert of Gàidhlig and Gaeilge songs performed by Nóilín Ni Cholla; hillwalking along the famous Colmcille Turas, a tour of the Fr. McDyer Folk Village, and traditional music sessions. Further information from Oideas Gael on oideasgael@eircom.net or 074 973 0248. FERMANAGH District Council is seeking to employ a dedicated Irish language officer whose role would include promoting the Irish language both within the Council and the wider community. The Sinn Fein proposal, which was discussed at last week’s Policy and Resources meeting, will be debated at next Monday night’s full Council meeting. The Impartial Reporter understands that Dr. John Kremer from Queen’s University met with councillors last week and outlined to them what an Irish language officer would be expected to do if employed by the Council and reminded them to be aware of current equality legislation. It’s understood that immediately after the presentation the councillors had to make a decision. Following a proposal by Sinn Fein, the councillors agreed to submit an application for funding to an outside body to recruit an Irish language officer. If successful in their bid, Fermanagh District Council will join other councils, such as Dungannon and Derry Council in employing a dedicated Irish language officer. At Derry Council, the Irish language officer’s job includes offering a complete range of Irish language services, such as the management of feedback, enquiries, comments, compliments and complaints via written correspondence, telephone and electronic communications and in person, provision of translation services, provision of corporate documentation, forms, leaflets and publications and the provision of media engagement services. The role at Derry Council also includes facilitating the use and promotion of the language. Asked about the Council seeking to employ an Irish Language Officer, no decision has been taken, said Fermanagh District Council Chief Executive, Mr. Brendan Hegarty. Is mian le Comhairle Cathrach Dhoire taighdeoir/éascaitheoir a cheapadh le tionscnamh Scéal na Gaeilge a fhorbairt. Oibreoidh an taighdeoir go dlúth le pobal na Gaeilge i gceantar Chomhairle Cathrach Dhoire le Scéal na Gaeilge sa cheantar a chur le chéile. Déanfaidh sé/sí taighde ar stair an scéil agus labhróidh sé/sí le réimse daoine fá stair, stádas agus todhchaí na teanga anseo. Úsáidfear an taighde a dhéantar mar bhunús chun taispeántas nua léirmhínitheach a chur le chéile a bhfuil sé mar chuspóir aige cur le feasacht an phobail i gcoitinne ar an Ghaeilge i nDoire. Tá sé fógartha ag an Roinn Oideachais agus Scileanna go mbeidh bunscoil nua le hoscailt i gceantar Dumhach Trá/An Rinn i Meán Fómhair 2014. 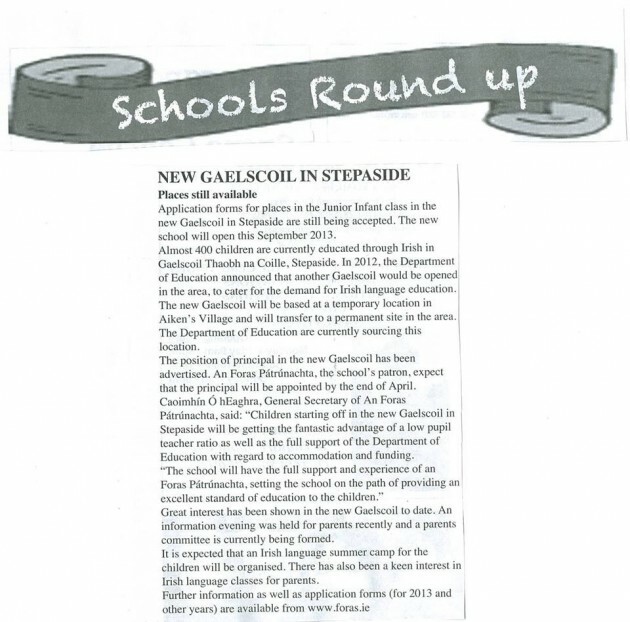 Tá feachtas ar bun le go n-aithneofaí an scoil nua mar ghaelscoil; níl aon scoil lán-Ghaeilge sa cheantar seo agus tá ró éileamh ollmhór ar na scoileanna lán-Ghaeilge sa cheantar máguaird. Tá oíche eolais eagraithe ag pátrún ionchasach na scoile nua, AN FORAS PÁTRÚNACHTA, le tacaíocht GAELSCOILEANNA TEO., eagraíocht comhordaithe na scoileanna lán-Ghaeilge, ar an 5 Meitheamh in Ionad Pobail na Rinne (Ringsend & Irishtown Community Centre) ag 7i.n. Tá an ócáid ar oscailt don phobal agus beidh sé dírithe ar bhuntáistí an oideachais lán-Ghaeilge do gach páiste. Is iontach an deis í seo don phobal úinéireacht a ghlacadh ar áis oideachais den scoth a bheidh ag an gceantar do na glúinte páistí amach anseo, scoil bheoga, rathúil go mbeidh siad an-bhródúil aisti. Ba mhór linn bualadh leat ann má tá suim agat bheith páirteach sa bhfeachtas le scoil lán-Ghaeilge nua a éileamh don cheantar. 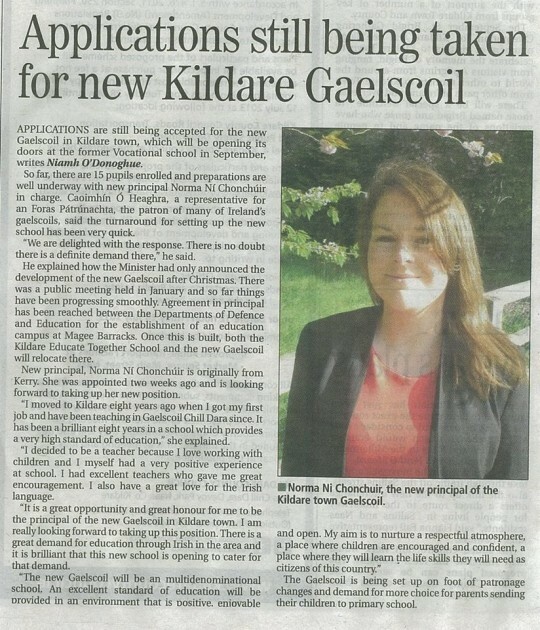 Tá tuilleadh eolais maidir leis an gcruinniú ar fáil ach teagmháil a dhéanamh le Clare ar 01 8535193 nó clare@gaelscoileanna.ie. Tá tuilleadh eolais maidir le AN FORAS PÁTRÚNACHTA ar fáil ar www.foras.ie. A vacancy has arisen for an Education Programme Manager in Ballymun Partnership Ltd for an initial period of six months, with possible extensions to this period. Ballymun Whitehall Area Partnership works with people who are socially excluded or are at risk of becoming so, and promotes social cohesion and labour market participation with a focus on the most disadvantaged neighbourhoods. This is achieved through a range of integrated activities in Education, Training, Job Placement, Early Childhood Services, Enterprise Support and Community and Environmental Programmes. Applicants should submit a CV with a covering letter by 5pm on Monday 3rd June 2013 to info@ballymun.org. Please include your availability and salary expectation. It is intended to hold interviews the week commencing 10th June 2013. This is a full time position, reporting to the Acting Chief Executive Officer, with responsibility for designing, implementing and evaluating the Education Programme for Ballymun and Whitehall in order to meet funder and company requirements. The position will initially be for a six month period, with possible extensions. 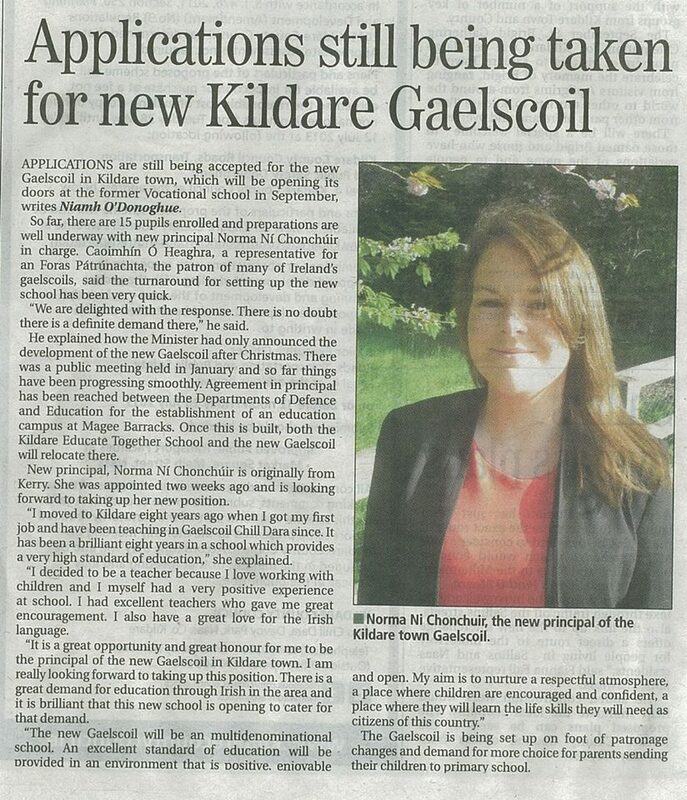 • To progress and develop mainstream Education provision through an area based approach in the Ballymun Whitehall Partnership area, particularly in conjunction with the Principles Network and Education Working Group Members. • Overall management and development of the Education programme for Ballymun and Whitehall. • Work in collaboration with major agencies in the area to facilitate and take responsibility for the training and education component of the Social Regeneration Plan for Ballymun. • Line management, mentoring and developing the Education team. • Represent the Partnership at education and other relevant fora. • To be available as a resource to community members, colleagues and others working in or for the Partnership to assist, and advise, regarding their engagement with the education system and to facilitate linkages where appropriate. • Work in collaboration with Senior Management and the Board of the Partnership. • Support the company in any other duties as and when they arise. • Continue to implement and evaluate the education programme within our annual plan, to meet forecasted targets (Action Output Indicators, Beneficiary Participation Rates and Strategic Plan Targets). • Manage co-ordination of programmes and seek out opportunities for strengthening inter-programme learning and sharing. • Ensure team targets, budgets and other key performance indicators set are met on a quarterly basis, in line with company and funder reporting requirements. • Provide problem solving, support & mentoring to team members where potential issues on task completion are identified. • Report to the Education Working Group regularly, in line with programme requirements, and liaise with the Chair of the Education Working Group on a regular basis. • Manage and develop the Education Team. • Ensure compliance with all Partnership policies. • Undertake annual appraisals of team members. • Delegation of tasks to the Education team, where appropriate. • Maintain project files for the Local Community Development Programme, in line with Pobal Financial guidelines. • Indentify funding opportunities, as required, in order to deliver or enhance identified actions within the Local Community Development Programme. • Deliver actions within funding requirements and company financial policy. • Initiate, develop, and maintain cooperative relationships and networks with key agencies and funders in relation to Education actions. • Listen to clients, volunteers, and the community in order to improve services and generate community involvement in regards to funded programmes. • Represent Ballymun Whitehall Area Partnership with the highest standards of integrity at all times. • Full clean driving licence. As the end of the school year beckons it is time to think about planning your child’s summer holidays. Fortunately, Conradh na Gaeilge may have just the answer for you. The Conradh na Gaeilge renowned summer camps commence in July in areas including Castlegar, Lackagh, Corofin, Annaghdown, and Athenry. Each camp incorporates the learning of Irish through sport, dance, music, art, games and other fun activities. With more than 30 years’ experience and a top class reputation to boot, Conradh na Gaeilge is a top choice when it comes to summer camps. Cuirfear tús an mhí seo chugainn leis an tsraith dianchúrsaí Gaeilge atá á eagrú ag Conradh na Gaeilge i nGaillimh. leibhéal – tosaitheoirí, bunleibhéal, agus meánleibhéal le costas ¤125 ar an gcúrsa. Le linn an chúrsa beidh béim mhór ar chomhrá agus ar labhairt na Gaeilge. Beidh na rannpháirtithe in ann feabhas a chur ar a gcuid Gaeilge labhartha trí chleachtadh agus trí theagasc den scoth. Maidir leis na rannpháirtithe a bhfuil Gaeilge níos líofa acu, múinfear roinnt gramadaí dóibh freisin agus beidh siad in ann tuiscint níos fearr a fháil ar scríobh na Gaeilge. Ní bheidh fadhb ar bith díriú ar ábhar nó ar riachtanais speisialta sna ranganna beaga seo freisin más gá. Cosúil le ranganna an Chonartha trí chéile beidh an curaclam ceangailte le curaclaim Teastas Eorpach na Gaeilge. East by South-west — they’re learning Chinese in Dingle! Graham Clifford visits the Kerry school teaching Mandarin to Gaelgoirs. In school I wasn’t exactly what you’d call ‘a natural’ when it came to languages. A long-suffering French teacher said that she soon realised I was Kerry’s answer to René from ’Allo, ’Allo! So as I approach the majestic driveway leading to Coláiste Íde just outside Dingle, the nerves are jangling. Palm trees pass me by on either side as I make my way through woodlands before reaching the main building. I’m here to learn my first few words of Chinese — but through Irish. I passed my comfort zone some miles back by Inch beach. I remember reading once that scholars in Kerry’s hedge schools learned to speak and write perfect Latin through Gaelic and I try to invoke their spirits as I walk towards the doors of this idyllic boarding school for girls with its 127 students. The West Kerry Gaeltacht wouldn’t be the obvious setting for Mandarin Chinese classes but in a cosy classroom I meet 20 young ladies who have been familiarising themselves with the language of the mighty land to the East. I get a bilingual welcome (in Chinese and Irish) but when asked if I’d like to be spoken to “as Gaeilge nó as Béarla” I opt for the latter. I’m hit with a dart of guilt similar to that experienced when opting for English when given the option at a cash machine. The teacher, Joan Lyne of Annascaul, reassures me that Chinese is not too difficult to learn and that I’ll pick up a “cúpla focal”. The girls are ready for action with copy books opened in front of them featuring complicated-looking Chinese characters or letters. Someone produces chop sticks. I’m interrupting their study-time and that’s the real reason for the buzz in the room! “So have any of you used Chinese outside the classroom?” I ask the students. A host of replies come back simultaneously. “I went in to a Chinese restaurant to say hi in Mandarin but it was an Irish person working there,” says one. I’m starting to think I could get the hang of this. Instead of pointing at number 22 in my local takeaway, I could confidently stroll in, exchange pleasantries with the staff and then request my favourite dish. But then I discover that a minor linguistic error could get you in serious trouble with the mammy. Mollaí Nic Suibhne from Dingle has developed a grá for the language and she gives me some background to how it’s written. I nod as though I clearly understand — I was always a half-decent actor. Using an interactive teaching package designed by the Chinese institute at UCD, Joan informs the fifth-year students here about Chinese culture as well as about the language. She’s added some of her own touches, too, from her year spent studying Chinese in UCC. These include an ‘amhrán náisiúnta’, or national song, which the Chinese play in place of their national anthem at sporting events such as the Olympics. I’m interested to find out if the girls, who received certificates as part of the Gaisce President’s awards for learning the language, feel that knowing some Chinese could be a major asset down the line. Local women Catherine Ní Dhubháin, Siobhán Ní Mhaoildhia from Tipperary, and Cork’s Gráinne Ní Shearta believe it could be the language of the future. “It’s unique and it’s growing,” they say, adding, “It really should be brought into the main curriculum. I mean, they’re (the Chinese) taking over the world. The jobs, technology and IT are in China. I step back into the West Kerry night with ‘Jasmine Flower’ still ringing in my ears and a phrase which will shock the owners of my local Chinese takeaway — “wo bú shì Zho-ngguórén” — it translates as “I am not Chinese” … they would never have guessed!